Click here for full flyer. Click here to see photograhs from the event. Started in 1998, the ground-breaking, award-winning, bi-national indigenous media organization Chiapas Media Project/Promedios will tour the U.S. in celebration of its 20th anniversary. Join us to welcome the tour in Santa Cruz on Tuesday, October 16 at the Nickelodeon Theater. 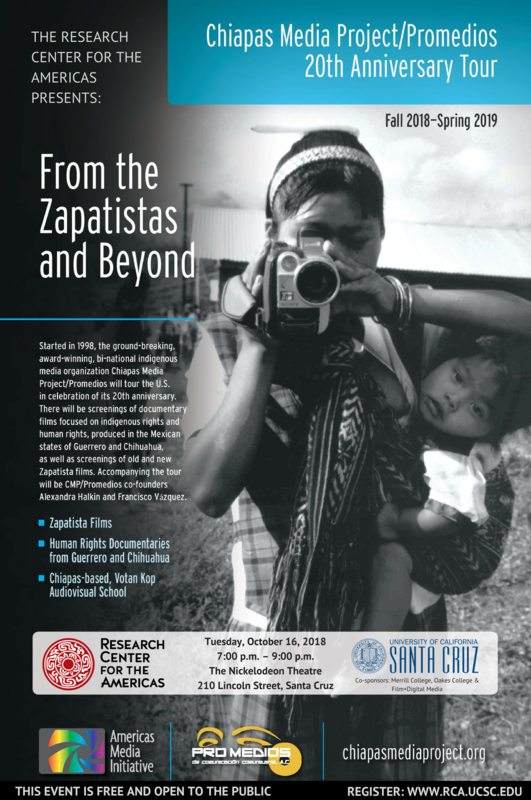 There will be four screenings of short documentary films focused on indigenous rights and human rights, produced in the Mexican states of Guerrero and Chihuahua, as well as screenings of old and new Zapatista films. Accompanying the tour will be CMP/Promedios co-founders Alexandra Halkin and Francisco Vázquez. A Q&A with the co-founders will proceed the screenings, moderated by Professor T.J. Demos of the History of Art and Visual Culture Department. Thank you for your interest in the Chiapas Media Project Film Screenings. This event has reached capacity, but we invite you to be placed on the waitlist list. We encourage you to use this waitlist, as we are frequently able to accommodate additional guests on the day of the event. Please arrive approximately 15 minutes before show time to secure your seat. We will begin admitting people on the waitlist at 7:05 p.m. In 1998, Alexandra founded the Chiapas Media Project an award winning bi-national organization that has trained over 200 indigenous men and women in video production in Chiapas and Guerrero, Mexico. Alexandra has consulted with various organizations such as Witness and CLACPI (Latin American Coordinator for Indigenous Film and Communication). In 2004, Alexandra was awarded a Guggenheim Fellowship for the Latin American Indigenous Video Initiative (LAIVI). In 2007, Alexandra was awarded a Fulbright Scholarship for the Indigenous Audiovisual Archive (IAA) in Oaxaca, Mexico. During this time she also produced five short documentaries in collaboration with Mexican human rights organizations - some winning international awards. Alexandra’s chapter, Outside the Indigenous Lens: Zapatistas and Autonomous Videomaking was published in the book, Global Indigenous Media, 2008. In 2010, Alexandra founded the Americas Media Initiative (AMI) a non-profit organization that works with Cuban filmmakers living in Cuba. In March 2012, Alexandra collaborated with the Museum of Modern Art Department of Film on a US documentary shorts program, Closing Distances/Cerrando Distancias that traveled to five towns in Cuba. In February 2013, Alexandra co-organized the New Cuban Shorts Program, part of the Documentary Fortnight Series at the MoMA. In 2014 AMI did the third Closing Distances/Cerrando Distancias tour with the PBS documentary series, POV and then Executive Producer, Simon Kilmurry. Alexandra has co-written and collaborated on several articles about Cuban independent filmmaking published in the New York Times, The Nation, LASAForum, NACLA and Filmmaker Magazine. Paco was born in the indigenous Nahua-Momoxca community of San Pablo Oztotepec south of Mexico City. He has studied photography at the Autonomous National University of Mexico (UNAM) and worked as a photographer and environmental activist in his hometown, winning the National Youth Prize for environmental protection in 1996. In 1998, he co-founded the Chiapas Media Project and has served as its Executive Director since 2003. For the past 20 years, Francisco has contributed to the democratization of media in Chiapas: training indigenous communities in media production, helping establishing Indymedia Chiapas in 2001 and providing technical support for community media projects throughout the state. Currently, he is working on the Chulel Project, a server that enables the sharing of multimedia materials for human rights organizations, indigenous communities, journalists and social activists lacking digital security and Internet connectivity. This event is co-sponsored by Merrill College, Oakes College, and Film+Digital Media at UC Santa Cruz.